On Tuesday this week I attended the Films by the Falls screening of ‘Puzzle,’ which was the first film shown on the newly installed screen and speaker system. I was always impressed with the efforts the Films by the Falls committee puts in to their monthly movies, and grateful to get the chance to see excellent films from the TIFF Film Circuit right here in our small town of Fenelon Falls. Each movie night I had attended previously was a great experience. However, this past week on movie night Films by the Falls really upped their game, debuting a brand new screen and speakers! While the old screen worked with a projector, this new screen acts more like a computer monitor; directly broadcasting the film to the audience. This new screen, along with the upgraded speakers, means that we are able to see and hear these films at their very best. Thanks so much to Films by the Falls for bringing these awesome monthly viewings to our community. Keep an eye out for their next movie on the last Tuesday of February to experience the new screen and speakers for yourself - see you there! Happy Holidays from the Town Crier Team! Hopefully you have enjoyed the evolution of our little community newsletter over 2018 - we have increased our frequency to weekly newsletters, given the whole thing a facelift, and our subscriber list continues to grow steadily. We'd love to hear from you in 2019! You always have the option to share an event, photo, or story idea with us for a chance to be featured in the newsletter, and a chance to win one of our monthly contests. Check out the questionnaire in this week's edition to give us some reader feedback and be entered in this month's contest. For the holidays the Town Crier newsletter will be on a brief hiatus to let our batteries recharge. We will be back in your inbox on Thursday, January 3rd, but until then we will do our best to keep the events calendar on the website updated with information sent to submissions@explorefenelonfalls.com. Warmest wishes for a safe and happy holiday season, see you in the new year! 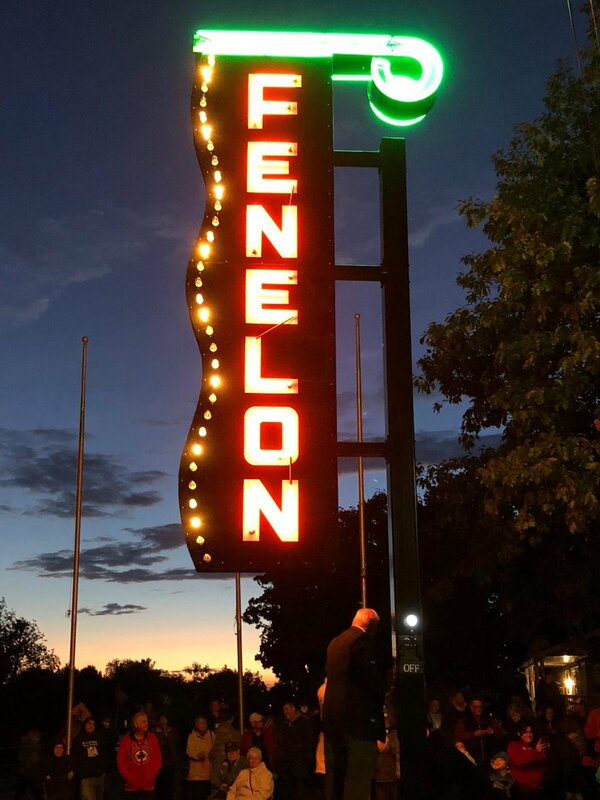 Last Saturday evening, a sizable crowd came out to celebrate and watch as the restored and refurbished Fenelon Theatre Marquee sign was lit up for the first time in its new location on Oak Street. The event drew many cheers when the switch was finally flipped, and brought on nostalgia for anyone who spent time going to the movies at the old Fenelon Theatre. Following the event, guests were treated to refreshments and a silent auction at Maryboro Lodge - The Fenelon Museum. Many thanks and congratulations to the committee of hardworking volunteers who took on this project and gave a new life to the Marquee sign and a new landmark for the town of Fenelon Falls! You may be thinking, wait a sec - didn't I just receive a Town Crier newsletter just last week?? And you'd be right! We have decided to update the frequency of the Town Crier to once a week, in order to keep the news brief and digestible, and to keep everyone informed on the most current events happening in our little community. As always, if you have an event, photo, or local interest story that you think would be a great fit for the Town Crier, share it with us: submissions@explorefenelonfalls.com. As this summer winds toward a close, remember not to take these days for granted: grab a frozen yogurt or ice cream cone, watch the locks, and catch one of our beautiful sunsets over Cameron Lake. In February we will be missing these hot and humid days! We are in the thick of summertime now, with one heatwave behind us and likely a few more ahead of us! Keep cool this summer with trips to the beach and splash pad, and grab a frozen yogurt at the Country Cupboard or a cone at Slices n' Scoops. We are growing this little newsletter again - be sure to check out the new sections "Art Space" and "Green Scene" for more great info on whats happening around Fenelon Falls. If you have a story or know of a resident you think should be featured in the Town Crier, reach out to us! Send your photos and story ideas to newsletter@fenelonfalls.info to contribute to your community newsletter. If you have any innovative ways to beat the heat this summer, please share your tips with us, and don't forget to wear your sunscreen!